The project brings together scholars of media and communications, government and international relations, physics, philosophy, linguistics and medicine, and is affiliated with the Sydney Social Sciences and Humanities Advanced Research Centre (SSSHARC), the Sydney Environment Instituteand the Sydney Democracy Network. Yet post-truth politics and “truthiness”, a term Stephen Colbert coined in 2005, are not solely British and American phenomena. “Truthiness” is rampant in Australia too. The debate about the proposed Adani Carmichael mine in central Queensland shows how truthiness has become part of Australian political discourse. How can a coal mine be subject to a regime of “truthiness”? A decision to build a greenfield megamine would appear to come down to the facts, with the known harms weighed against the potential benefits. Yet we can identify three distinct traits in official discourses around the Adani mine that show truthiness at work. First, “truthiness” replaces a reliance on facts with appeals to emotion and a logic of “gut feelings”. Coal is good for humanity, coal is good for prosperity, coal is an essential part of our economic future, here in Australia, and right around the world. Earlier in 2014, he had said that “it is our destiny in this country to bring affordable energy to the world”. In addition to the feel-good narrative of coal as national saviour, politicians have argued that Australia’s coal will help the world solve environmental problems, rather than making them worse. An excellent example of this reasoning comes again from the former prime minister on his visit to India in September 2014. There, echoing the Adani chief executive, Abbott argued that the Carmichael mine could improve Indian living standards and cut carbon emissions by providing “clean coal”. Using this same emotional logic, the government later told parliament that opening the southern hemisphere’s largest coalmine would actually cut carbon pollution. A second component of “truthiness” is the practice of deliberately presenting empirical facts as debatable, uncertain or political – or simply lying. The best examples of lying are the claims of the mine’s benefits to Queensland and Australia. Most common are references to the number of jobs the Carmichael mine will provide to the Queensland economy, where the employment situation is portrayed as desperate. The Adani Carmichael coalmine offers up to 10,000 new jobs, mainly in Queensland; A$20 billion of investment in Australia; and power, to build the living standards of 100 million people in India. In fact, Jerome Fahrer, who prepared an economic assessment of the Carmichael mine for Adani, admitted in court that it will create an average of 1,464 direct and indirect jobs over the life of the project. Yet virtually every mine supporter has since 2014 repeated an incorrect figure of 10,000 new jobs. They include the prime minister, the attorney-general and federal and state Liberal and National Party MPs. Another prominent tactic used to cast unwanted facts as debatable or doubtful is to generate oxymorons that promote contradictory messages. This government strongly supports the sustainable development of the Galilee Basin for the jobs and economic development that it will provide for regional Queensland. Perhaps the most pernicious oxymoron used by mine supporters is “clean coal”. To counter the claim that Galilee Basin coal is “clean”, The Australia Institute cites estimates by Adani and India’s Ministry of Coal that it “is only 10% above the average quality of domestic Indian thermal coal in terms of energy content”. This is because “the ash content of Carmichael coal is estimated to be 26% – more than double the average of 12% for Australian thermal coal”. The institute also notes that transporting the coal inevitably creates extra pollution. Third, to construct truthiness, statements that are not scientific, logical or fact-based have proliferated in the political debate about the Adani mine. Politicians have constantly reframed the term “activist” to connote an enemy of both the mine and the national interest. MPs have called members of green groups economic saboteurs, “vigilantes”, “terrorists” and “extremists”. Their lies, misinformation, slander and the frivolous legal action attacking a company for the sake of furthering an ideological cause can only be described as terrorism if you look at the criminal code. The accusations of “eco-terrorism” and “sabotage” had no foundation in fact whatsoever. These claims were not linked to actual illegal activities by environmental groups opposed to the mine. Queensland taxpayers will not be funding any infrastructure for this project. Stringent conditions will be enforced to safeguard landholders’ and traditional owners’ interests. To keep Queensland taxpayers from funding the mine’s infrastructure, the burden will fall instead on Australian taxpayers via the Commonwealth government’s proposed $1 billion loan from the Northern Australia Infrastructure Facility to Adani. This will fund rail lines from the mine to the coast. Nor have the rights of the traditional owners of the mine site been respected or upheld. The state and federal governments and courts have denied all legal challenges from the Aboriginal people most affected by it. The primary purpose of dissecting the arguments in favour of the Carmichael mine is to demonstrate the complexity of “truthiness” regimes. None of these discursive forms – gut feelings, spin and the politicisation of unwanted facts, or even outright lies – are enough on their own. Rather, these strategies overlap, intersect and reinforce each other. The effect is to create an overarching “truthiness” regime that presents new megamines as desirable, inevitable and essential to maintain Australia’s national destiny. In response, a more complex and multi-pronged approach will be needed to convince the voting public that coal mining is not good for Australia, its economy, or the globe. Why, if Adani’s gigantic Carmichael coal project is so on-the-nose for the banks and so environmentally destructive, are the federal and Queensland governments so avid in their support of it? Once again the absurdity of building the world’s biggest new thermal coal mine was put in stark relief on Monday evening via an ABC Four Corners investigation, Digging into Adani. Where the ABC broke new ground was in exposing the sheer breadth of corruption by this Indian energy conglomerate. And its power too. The TV crew was detained and questioned in an Indian hotel for five hours by police. It has long been the subject of high controversy that the Australian government, via the Northern Australia Infrastructure Facility (NAIF)that is still contemplating a A$1 billion subsidy for Adani’s rail line, a proposal to freight the coal from the Galilee Basin to Adani’s port at Abbot Point on the Great Barrier Reef. But more alarming still, and Four Corners touched on this, is that the federal government is also considering using taxpayer money to finance the mine itself, not just the railway. As private banks have walked away from the project, the only way Carmichael can get finance is with the government providing guarantees to a private banking syndicate, effectively putting taxpayers on the hook for billions of dollars in project finance. JAIRAM RAMESH: “Ultimately, it’s the sovereign decision of the Australian Government, the federal government and the state government. FOUR CORNERS: “But public money is involved, and more than public money, natural resources are involved. Here we have a project that does not stack up financially, and whose profits – should it make any – are destined for tax haven entities controlled privately by Adani family interests. Yet the Queensland government has shocked local farmers and environmentalists by gifting Adani extremely generous water rights, and royalties concessions to boot. Why are Australian governments still in support? The most plausible explanation is simply politics and political donations. There is no real-time disclosure of donations and it is relatively easy to disguise them, as there is no disclosure of the financial accounts of state and federal political parties either. Payments can be routed through opaque foundations, the various state organisations, and other vehicles. Many Adani observers believe there must be money involved, so strident is the support for so unfeasible a project. The rich track record of Adani bribing officials in India, as detailed by Four Corners, certainly points that way. But there is little evidence of it. In the absence of proof of any significant financial incentives however, the most compelling explanation is that neither of the major parties is prepared to be “wedged” on jobs, accused of being anti-business or anti-Queensand. There are votes in Queensland’s north at stake. Furthermore, the fingerprints of Adani’s lobbyists are everywhere. The former ALP state secretary held meetings in April and May with Ms Palaszczuk and her chief of staff David Barbagallo to negotiate a government royalties deal for Adani, after a cabinet factional revolt threatened the state’s lar­gest mining project. So it is that Premier Palaszczuk persists with discredited claims that Carmichael will produce 10,000 jobs when Adani itself conceded in a court case two years ago the real jobs number would be but a fraction of that. If the economics don’t stack up, why is Adani still pursuing the project? The Adani group totes an enormous debt load, the seaborne thermal coal market is in structural decline as new solar capacity is now cheaper to build than new coal-fired power plants and the the government of India is committed to phasing out coal imports in the next three years. Why flood the market with 60 million tonnes a year in new supply and further depress the price of one of this country’s key export commodities? The answer to this question lies in the byzantine structure of the Adani companies themselves. Adani already owns the terminal at Abbot Point and it needs throughput to make it financially viable. Both the financial structures behind the port and the proposed railway are ultimately controlled in tax havens: the Cayman Islands, the British Virgin Islands and Singapore. Even if Adani Mining and its related Indian entities upstream, Adani Enterprises and Adani Power, lose money on Carmichael, the Adani family would still benefit. The port and rail facilities merely “clip the ticket” on the volume of coal which goes through them. The Adani family then still profits from the privately-controlled infrastructure, via tax havens, while shareholders on the Indian share market shoulder the likely losses from the project. As the man who used to be India’s most powerful energy bureaucrat, E.A.S. Sharma, told the ABC: “My assessment is that by the time the Adani coal leaves the Australian coast the cost of it will be roughly about A$90 per tonne. This renders the whole project even more bizarre. Why would the government put Australian taxpayers on the hook for a project likely to lose billions of dollars when the only clear beneficiaries are the family of Indian billionaire Gautam Adani and his Caribbean tax havens. My view is that this project is a white elephant and will not proceed. Given the commitment by our elected leaders however, it may be that some huge holes in the earth may still be dug before it falls apart. The Australian government’s strident criticism of Westpac for not financing the Adani Carmichael coal mine is out of step with the economics. As the cost of renewable energy falls and its adoption increases, fossil fuels are becoming a riskier investment. It’s not just Westpac. This shift is reflected right across the finance industry. The big four Australian banks have all declined to finance this mine, as have many large international financial institutions. The Commonwealth Bank quit as the project’s financial adviser in August 2015. NAB ruled out financing the mine in September 2015. ANZ effectively ruled out financing in October 2015 and again, more firmly, in December 2016. Big overseas financiers Standard Chartered, Barclays, Royal Bank of Scotland, Citi, HSBC, Morgan Stanley, Société Générale, Crédit Agricole, JP Morgan Chase, Deutche Bank and BNP Baripas have also already abandoned or made clear their lack of support for the mine. Adani’s coal was to be used to generate electricity in India, recently seen as the future for the product given China’s shift away from coal. But Indian demand for coal is slipping. Its new National Electricity Plan has renewables rising from the current 15% to 56% of installed power capacity by 2027. The Indian government itself now thinks it may not need any new coal power plants for at least a decade. As mines require a huge initial investment that pays itself off over many years, this increases the risk that the Carmichael mine will become a “stranded asset”. Sure, financial institutions are under pressure from customers and activists to avoid investments that damage the climate. But for these institutions, such pressures only make a difference at the margin. For them it is the poor economics of coal that is fundamental. The long-term prospects of coal are weakened by the rapid changes in technology and the deterioration of the climate outlook. Solar energy prices have fallen more rapidly than most expected, and battery technology and use is rapidly improving. A recent study found that solar energy is on a trajectory to supply at least 3 terawatts (TW) of power globally by 2030, and potentially up to 10TW if certain barriers to installation can be overcome. For comparison, the world’s total electricity capacity from all sources as of 2014 was just 6TW. Financiers’ minds may be focused still further by the fact that, if anything, scientists appear to have underestimated the effects of climate change on sea levels, polar ice caps, and methane emissions from thawing permafrost and lakes. The fact that the financial industry is reluctant to fund the Carmichael mine is just one example of the phenomenon described in a report by the Asset Owners Disclosure Project (AODP) as “a fundamental power shift … from short-termers to long-termers”. There are several reasons for this, besides the changing economics of renewable technology, the worsening climate outlook, and the shifting policies in countries like China and India. New tools are being developed to enable investors to quantify the impact of climate on their investments. In financial circles, the more things can be counted, the more they count. Superannuation funds and overseas pension funds need to invest over long periods of time, and so are now forced to invest with climate change in mind. They can’t afford to have a stranded asset on their books. Reinsurers – essentially large firms that provide insurance for insurance companies – face the same issue. They need to minimise exposure to extreme weather events, which are increasingly influenced by climate change. Fund managers are creating financial products to enable investment in climate change adaptation. And some investors are taking more control over their investments, rather than leaving them in the hands of fund managers, so they can give appropriate priority to climate issues. This is not to say that financiers around the world are uniformly reacting to climate issues. The AODP report shows that, on average, European and Australian asset owners and fund managers have done well in acting on climate risk, whereas American, Middle Eastern and (until now) Chinese ones have done poorly. It’s also not true that finance has uniformly abandoned short-termism. “Climate-interested investors” currently account for just a third of the ownership of the world’s very large corporations. But no one is going to make even short-term profits out of the Adani coal mine, with its huge upfront capital investment, unless they get a substantial subsidy from the taxpayer. And the long-term prospects look grim. Those who argue that Westpac’s decision was “illogical” are swimming against both the financial and technological tides. The news last week that Australia’s oldest bank, Westpac, has withdrawn from any prospect of financing Adani’s Carmichael coal mine may well be the death knell for the controversial project. Westpac is the last of the big four Australian banks to have ruled out investing in Adani. ANZ declared its move away from mining in December 2016. The Commonwealth Bank and NAB dissociated themselves from Adani in August and September 2015. The move means that, even if the Northern Australia Infrastructure Fund proceeds with a A$1 billion subsidy for the mine in the form of a dedicated, “private” railroad for Adani to export the coal, the mine is unlikely to proceed. 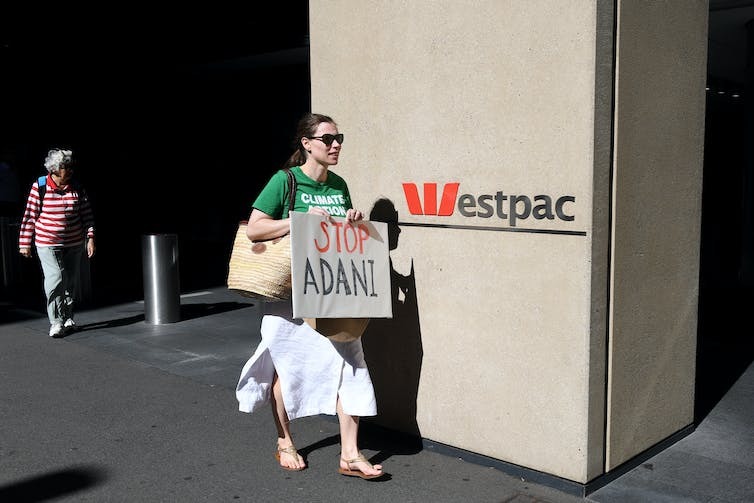 The timing of Westpac’s decision may be a response to the multiple campaigns being launched against Adani, including consumer activism targeting the bank itself. Westpac may have perceived these campaigns could have an impact on its customer base, and the savings accounts that underwrite its lending revenue stream. It responded with an update to its position statement on climate change. The statement specifies terminating financing mines with coal quality of less than 6,300 calories per kilo – which rules out Adani’s lower-quality coal from funding. This is significant beyond just ruling out Adani. Westpac is the first of the big four banks to put restrictions on new thermal coal mines. This signals the largest financial players in Australia are accelerating the transition away from coal, and – as the position statement outlines – toward increasing lending to renewables and energy efficiency projects by two-thirds. Climate solutions finance group Market Forces’ executive director Julien Vincent said Westpac has “raised the bar” on climate change for the other banks. Whereas banks used to watch each other for who was going to pass on interest rate cuts, it seems now they are also mindful of who is doing the most for climate change. But even without its new position statement, Westpac could not expose itself to the obvious risks of funding a project that will so rapidly devolve from a global climate pariah to a fossilised stranded asset. The cumulative emissions related to this mine … are amongst the highest in the world for any individual project, and – to the knowledge of the authors – the highest in the Southern Hemisphere. Given our current atmospheric CO₂ is 407.5ppm, this gives us 43ppm left to keep warming under 1.5℃, according to IPCC trajectories. Even at Adani’s own conservative estimates that it will emit 4.7 billion tonnes of greenhouse gases, which is almost 11% of the remaining global carbon budget. 1.5℃ of committed warming presents an adaptation nightmare for coastal communities around the world. This level is almost approaching the Emian period of 120,000 years ago, when sea levels were six-to-nine metres higher than they are today. So, while Westpac still has a way to go before it gets off the Market Forces watch-list of fossil-fuel-friendly banks, it has managed to avoid an investment and PR disaster. Westpac would have studied India’s electricity plan, released in December, which abandoned building any new coal-fired power stations in the next decade in favour of 350 gigawatts of new solar and wind power. Over the weekend, Shadow Environment Minister Mark Butler pointed out that the Modi government has said it intends to phase out thermal coal imports entirely by 2020. But this did not stop Barnaby Joyce, on Q&A on Monday night, wheeling out the much-discredited argument that Australia has a “moral obligation” to help India keep its lights on. This is actually morally bankrupt when you consider that India is planning to look after itself with renewables. The turning tide has not stopped The Australian newspaper from doing all it can to support the mine. This has included giving plenty of airtime to Resources Minister Matt Canavan, who last week labelled Westpac “wimps” for abandoning the mine. The Australian reported over the weekend that Canavan met with Guatam Adani in Brisbane, and was “confident the project would get the finance it needed from other lenders”. Bill Shorten’s repositioning on the Adani coalmine in north Queensland appears to be yet another political retreat into the inner-city streets of leftist fanaticism. What such a campaign tells us is it seems to be crunch-time for the mine – and the future of the entire Galilee Basin, whose coal deposits will be made to look a little more viable if that railway gets built. But opposition to the railway subsidy has surfaced in the most unlikely of quarters. Sydney shockjock Alan Jones has weighed in, denouncing the subsidy as a case of taxpayers funding a private venture that is not in the national interest. Paradoxically, Jones ended his outrage by comparing funding Adani with subsidising windfarms, for which Australians – both present and future – are direct beneficiaries in so many ways. But both The Australian and Jones have ignored the the big story on investment into renewables. Whereas a giant coal-mining company has taken seven long years to realise no-one is listening – except for major political parties, perhaps eager for political donations they are accustomed to from the mining industry – investors can’t get enough of renewables. Investment opportunities for community projects have been selling out within minutes. Grassroots solar projects are in high demand for investors. Fifty such projects have been established across Australia and are backed by $24 million. But the ABC reports Australia lags behind Scotland, Denmark and Germany, which all have extensive energy co-operatives that are promoting wind more than solar. With an average of 7% return on investment, the appetite for such projects in Australia is obviously strong. And it will only take local communities and small businesses to be better organised to take advantage of the renewables investment revolution. At the very least, the remarkable appetite for renewables investment will drive the large banks and lending institutions to service this growing market. With thanks to Tahnee Burgess for research assistance on this article.